I keep seeing this photo on Pinterest of a lucky bride showing off her gold Christian Louboutins. And I’ve got to say, they’re a gorgeous pair of shoes, no? The only problem with these pretty pumps? They likely retail for upwards of $1,000. And how many brides have an extra grand laying around to spend on their wedding day shoes, which will spend most of the day staying hidden underneath their wedding dress, anyway? Yeah, not many. That’s why I’ve rounded up some less expensive lookalikes…so you can enjoy the look without the price tag! 1. Style&co. Simmone Platform Evening Sandals. 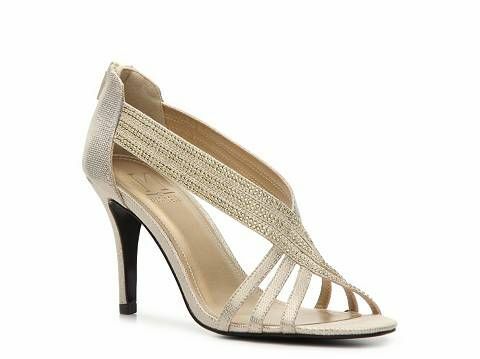 Same crisscrossing straps and peep toe, but at a fraction of the price! On sale for $39.99 at Macy’s. 2. 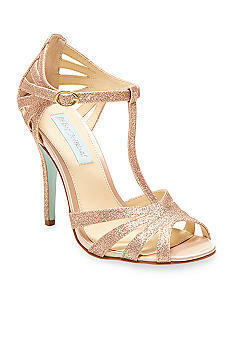 Steve Madden Feliz Glitter Sandal. More crisscrossing, strappy goodness. $49.95 at DSW. 3. Betsey Johnson Tee Sandal. Not quite the same styling as the Louboutins, but still has the peep toe/strappy look. $69.00 at Belk. 4. M by Marinelli Splendid Sandal. Again, a slightly different look, but still has those key elements (gold, crossing straps, peep toe) like the Louboutins. $59.95 at DSW. What do you think about these lookalikes, belles? None of them are exactly the same as the Louboutins, of course, but isn’t the price difference just fabulous?